If you are a woman looking for a good, decent, and reliable e-bike that can help you commute and run errands around town, the Currie Technologies eZip Women’s Trailz e-bike is a highly recommended option for you. The eZip series by Currie has brought many people back on a bicycle due to its affordable prices and nice features that give you a comfortable ride and unprecedented fun. Currie knows what women prefer and what their comfort levels are when they are riding a bike. This bike is made with a step-through frame, making it suitable for women to ride it even with their skirts on. So, whether you are commuting to work in a professional dress or going to the grocery at night, the eZip Trailz is the perfect bike for you. It gives you all the benefits of riding an e-bike, just without having to pay a hefty amount. Available at less than $500, this one is truly worth the money. The positive reviewsthis e-bike has earned are not without reason. It is equipped with great features that make it a decent bike to buy. In the section that follow in this review, we overview these features in more detail. The women’s Trailz is made with high quality Currie Hi-Ten steel, which is a great choice for an electric bike due to its toughness. Plus, it is not just a men’s bike painted in a different color. This one features a low step through frame that is ideal for women who want to ride with any type of clothes, even skirts. The low, step through frame is especially designed for easy getting in and off the bike. To enhance the comfort level, the bike features a comfort style saddle and mid-rise handlebars for an upright and comfortable riding position. Plus, to enhance stability on bumpy roads, the bike features a suspension fork that will smooth out all vibrations on bumpy roads and from obstacles like potholes along the way. While the thicker road tires drastically reduce rolling resistance and gives you a fast rolling machine, the suspension fork makes sure you will enjoy a comfortable ride no matter where you are going. When all this is combined with Shimano 7 speed rear derailleur and easy gear shifters, you get a bike that will easily roll on flat roads and climb hills without any hassle. This bike features not only one but two user selectable modes that is, pedelec or twist ‘n’ go. Pedelec bikes are rarely found at this price; this is a feature mostly found in higher end models. The Pedelec mode allows you to trigger motor assistance while you pedal, making you feel bionic. It gives up to 50% motor assistance. On the other hand, twist ‘n’ go allows you to use 50-100% motor assistance, allowing you to commute without putting any effort at all. The Trailz features the Currie patented electro-drive system, which has been used in all Currie e-bikes since a decade. This is a good and proven electric system with a motor, which is a not a cheap hub motor. It uses a chain drive, brushless motor, that will give you power up to 450W, enough to take you on streets and hills with speed up to 15 mph. It includes SLA type batteries that are mounted quite low on the rear instead of being strapped on the rear rack. This is a great advantage as it shifts the weight down and also makes it possible for you to easily install another battery pack if needed. The battery has a fairly good range of 15 to 20 miles, depending on how much you use it. The eZip Women’s Trailz e-bike is rated as the Best of Best in Amazon’s top rated electric bikes. It enjoys raving reviews by customers with a rating of 4.4 out of 5 stars and 66 customer reviews till date. 1. It is easy to assemble. 2. Charging the battery is very easy as the battery can be unlocked easily to take inside for charging and can be locked back without any trouble. 3. It zooms up hills without any problems, even with someone who is overweight. 4. The 7 speed gear shifts are quite satisfactory. 5. Great price. Users loved its affordable price and found the bike truly worth what you pay for. 6. The motor power is great with 450W, which is a lot higher than other similar bikes with 250W, making it great for hills. 7. Having both PAG and TAG modes is an advantage that not even high end bikes have. 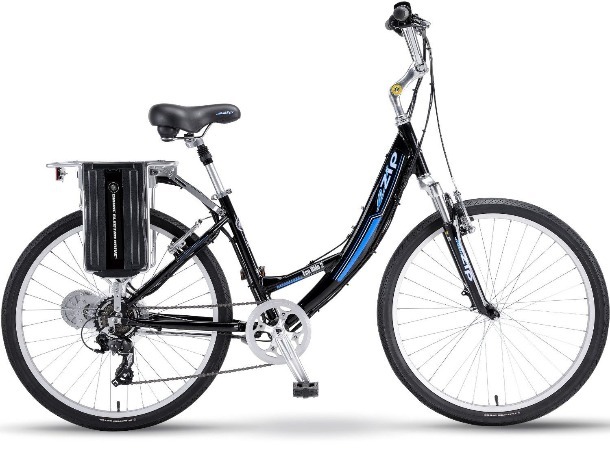 Pedelec modes are usually found in higher end models and even those do not have a twist ‘n’ go option. 8. There is place for two batteries so you can easily double the range. 1. Battery quality is not good as it is cheap lead acid type, not the expensive lithium ion. A lithium battery – having less power capacity than this one – will cost around the same as this entire bike and battery. 2. Battery is quite heavy that shoots up the weight of the bike to 70 lbs, which is quite heavy to handle. Although the motor takes the strain but if you need to take it up the stairs and get it into the back of a car, it means strenuous work. Plus, if the battery fails, pedaling it back home is very tough. 3. The battery is good for the first few times but starts losing its power drastically. 4. The manual is poorly written with no clear instructions and even has misguided information. 5. The twist control ring is quite small and becomes tiring to use. A great purchase overall. You will simply not find a better bike with a more advanced feature set than this one. This is the best money can buy.